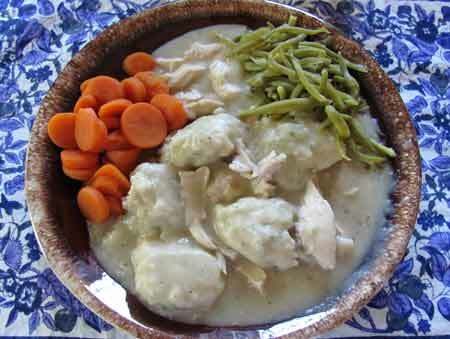 My homemade chicken and dumplings. Some people like to put carrots and celery in this recipe, I like my veggies on the side. 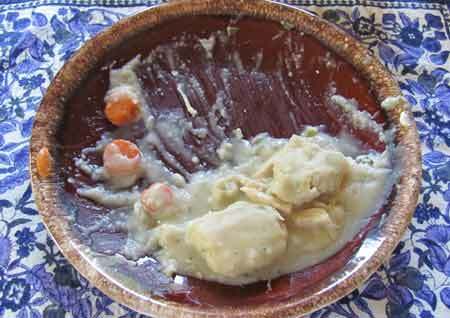 I was stuffed, could easily have left more on the plate. Make a similar portion reduction every day for a year and lose 13 pounds with no other changes to your diet or exercise activity. Restaurant versions of this recipe can easily top 800 calories per serving. If you don't have a recipe yet, I urge you to add simple chicken recipes to your repertoire. Use quality, fresh ingredients, eliminate fat and you have a satisfying, healthy meal.